So I’m getting ready to move in less than a month, having found a lovely little adobe home-share situation. Because the place is already well-established with current tenants, much of my furnishings will either go to my son for safe-keeping or be given away. While culling and pitching things is cathartic, it comes with some sadness at times. In general, however, lightening my load is liberating. Some of the process is downright entertaining even, leaving me to scratch my head in wonder as to why I’ve thrown certain things in drawers in a slap-dash way thinking I’ll deal with them later which, of course, never happens. There are the myriad paper clips, safety pins, stray business cards, occasional screws, miscellaneous scraps of paper with ‘notes to self’ to undertake some course of action but promptly forgotten once out of sight. Now I have never been a hoarder. It is anathema to my general tidy-up character. Yet I’ve not been exempt from clutching certain items much like a small animal does. It’s laughable when seeing a burrow filled with bits and bobs scavenged by the prairie dog or raccoon shown on Animal Planet. I feel no different then they, maybe even a kinship with the creatures who exhibit this same kind of behavior as mine. For example, I hold onto a delicate pressed flower entombed in acrylic once given to me from a friend. Even though it was freighted with preciousness at the time, the feelings have long since dissipated. Yet still it hangs on the wall. I’ve moved the thing from one home to another, evidently clinging to the once important feeling it arbitrarily possessed. Looking back, it seems so silly. This time it goes to Good Will or maybe even the trash and be done with it. This is not to say I haven’t off-loaded tons of possessions during previous moves or even in the course of periodic clean-outs. I have! Compared to the average American, I don’t save much, or even have much, being a minimalist at heart. Yet still I keep more than I need or even want, consciously that is. But therein lays the rub. What comfort do the no-longer-emotionally-relevant artifacts that populate my life really mean if they’re, well, no longer relevant? Do these things define me now? Do I keep them to remind myself of a former ‘me’? I recall when my favorite uncle died a number of years ago, his daughter-in-law asked me several times did I want anything from his house. Early on, I told her ‘no,’ having a mother lode of sorrow for his suicide at nearly 94 years of age. What compensation for his death is there in an antique bench, a beautifully crafted dresser with matching mirror? In the end, I did take the bench but only after she pressed me, and this, in spite of her comment of “when a person dies there’s just stuff left; it’s only stuff.” Why that turned the tide for me remains a mystery to this day other than to say it is only ever the meaning we attach to things that prompts us to cling to the meaning it holds. Evidently, the bench was tethered to my feelings for and about him. And so the bench memory has surfaced once again as I prepare to move across town. It’s more than a bit and bob, that’s for sure. Yet, going to a place with less space I must consider: should I take it? 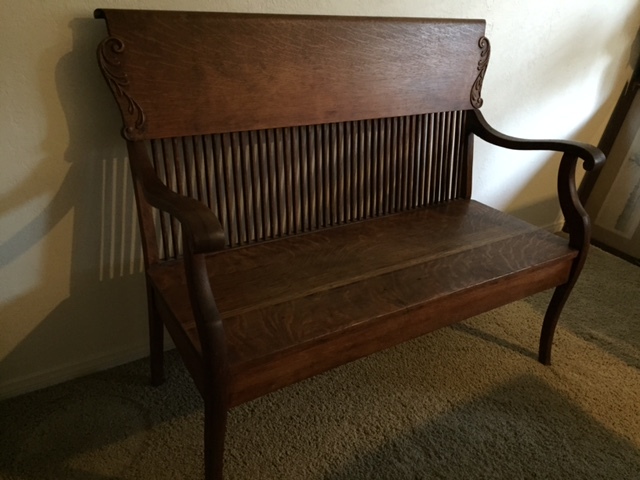 Do I need the bench, emotionally or otherwise? Yes it’s an antique, yes it has financial value, I tell myself, but that is not why I keep it, not really. I keep it because it informs me of the interface between my life and my uncle’s. Not his death, his life! The bench has long been a symbol of how he lived which is to say with courage, strength, hard work, honor, and humor, oh yes, an incredible sense of humor—all qualities I admire and want for myself. While I was aware of those qualities of his, I often brushed past them without really seeing other aspects of his character, let alone his struggles. How is it we zero in on some parts of a person and ignore others? Of course, an attachment or identification to a person is not the same as to an object, or so it seems. Yet an object can render not just the memory of a man, say, or the thing itself; it renders the state of being in which either or both resides. Memory recalls essence far beyond the attachment, with the pull remaining fixed, operational, in the now. When my uncle died I recall massive confusion about what must have been his monstrous sorrow and hopelessness that drove him to take his own life. How, how, how could he have thrown the rope on the rafter given the internal strength I perceived him to have? In my thirties at the time, it was beyond comprehension how he could be so tired of living. Where had that strength gone? Had I invented the perception? And how, how, how could I ever get over feeling some sense of responsibility for his presumed loneliness and ultimate death in spite of how irrational that even sounds? In spite of the fact that I could not have prevented it, was unable to see him more, to save him, intellectually I know he was not mine to save. Intellectually! Yet his life and his death, and by extension, the bench, carry a message of compassion, dare I say, forgiveness not only for his act, but for mine as well—for my being young and not knowing any better, for not seeing an old man’s pain and exhaustion, for not being evolved enough, surrendered enough to just, oh, I don’t know, get it. Now in my sixties, I have come to see it takes what it takes to see things differently. After all, none of us can force a maturational, emotional, or spiritual evolution, or so it seems to me. The conditions just have to right. At the heart of things the bench carries a message, one of connection we all share, of the inevitable struggle against the vicissitudes of life be they old age, bankruptcy, the horrors of war, Parkinson’s disease, whatever. Each person has his or her own karmic challenge constantly presenting choices on not just whether to live or die, but how to do either of them. It is the pull towards something greater than ourselves that we sniff out but all too often ignore thinking we have all the time in the world. Time for what, you ask? To be a better person, exercise more compassion, forgiveness, do the work one is meant to do. Why the list can be as long or as short as someone’s goals, karma, or both. I have a 91-year-old friend who lost both her sons to suicide and her husband before that. She has long resisted going through boxes of her sons’ things but is slowly doing so now. While I cannot know the mind-numbing, gut-wrenching experience she has endured with their individual and collective deaths, I sense the enormous difficulty of revisiting the state of being in which her life interfaced with theirs, the role it must have played. Still she carries on. Remarkably, her stoic nature, while limiting in some sense, has served her well in another. In fact, her largest Self somehow informs her to keep putting one foot in front of the other. She insists on living by just doing it, possessing a reverence for something greater, and in spite of their acts as well. It seems to be an understated yet potent kind of bravery. In fact, that bravery and reverence may not even be terribly conscious on her part even in the face of its operation. Ironically, she reminds me of my Holocaust friend, Bennet, determined to keep on living almost beyond belief even though each of their circumstances are decades and continents apart. In spite of the fact that it’s flat out hard to be a human being sometimes, most of us can’t resist it! So on we trudge. Anyway, I’m taking the bench. It serves not just as a reminder to be aware of someone else’s walk through life, of the struggles they endure whether obvious or not, whether unresolved or not, but also for my own. Just as importantly, the bench symbolizes an enduring livingness, one that ultimately transcends life’s vicissitudes until such time as the big Self, the Higher Self, takes over. For me, my uncle’s bench also represents the privilege as well as the responsibility for life, to do the best we can, and forgive the things we’re not good at, or even fail, including one’s own self. And while I don’t really need the bench to remind me of this, it serves as a visible expression, a kind of ‘flashcard’ as it were, and a beautiful flashcard at that! This is a wonderful, well-written evocative piece relevant to anyone who has gone through a time they needed to pare down their life. Which memories to discard and which to keep…what a tough decision. I’m glad she decided to keep in the bench in the end. It still connects her to the past and the relationship she had with her uncle. Nice, nice story. Beautifully written and so profound! And the picture is a very nice touch!